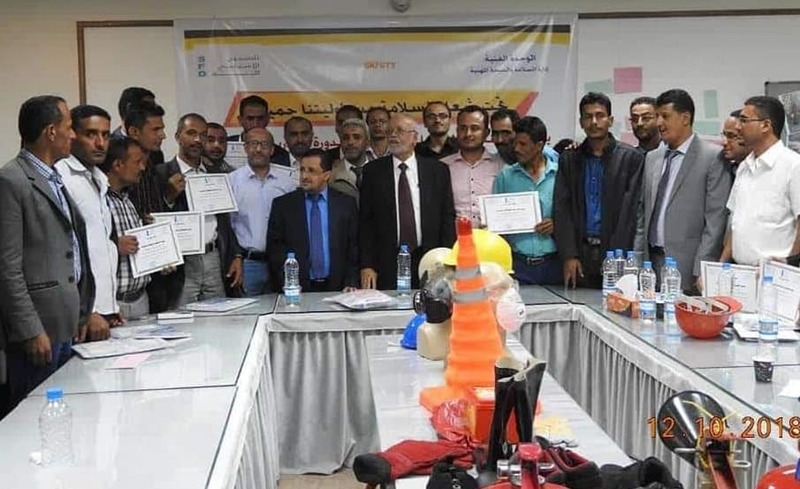 The Social Fund for Development concluded its training program on (Occupational Safety and Health in SFD Projects) in Sana'a City. The activity targeted project officers and consultants working in different governorates. It aims to protect workers in the SFD projects and prevent any work-related casualties as a commitment from SFD and its donors to protect its beneficiaries. During the week-long program, the participants were briefed on the potential sources of accidents and the necessary safety measures and tools to protect the workers and that suit the environment, nature and risks of the work. They also conducted practical experiments aimed at ensuring the participants' ability to prevent the incidents in order to continue to enforce the safety practices in the SFD as perfect as possible in all workplaces. This and the coming similar programs come as implementation of the SFD’s trend and strategy to enhance the culture of occupational safety and health in all SFD constructional projects and ensure a safe working environment for all workers.